Properly maintaining your handgun is an essential part of owning a firearm. Dirty or dry handguns can cause shooting malfunctions and permanent damage, so it's important to properly care for them. Taking a few extra minutes to clean your handgun immediately after use and before putting it into storage can provide extra reliability for your firearm, ultimately keeping you and your family safe from harm. The experts at the veteran-owned-and-operated Protect Institution in Florence, KY, provide advanced firearm training to the greater Cincinnati area and offer tips for cleaning your firearm. Buy a Cleaning Kit: If you own a handgun and have a concealed weapon permit, one of the most important supplies to add to your arsenal is a handgun cleaning kit. You can buy one of these from a sporting goods store or a firearms trading show. Unload Your Handgun: In handgun basic training, one of the most important things you'll learn about owning a handgun is to remember to clean and unload your gun before storing it. 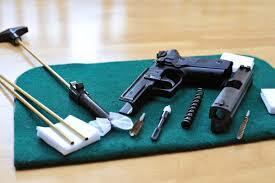 Set Up Outside: Cleaning your gun outside—or in a well-ventilated space—is necessary. The solvents and fumes from your cleaning kit can be dangerous in a closed off area. Once you’ve purchased your cleaning kit, unloaded your handgun, and set up your cleaning space in a well-ventilated area, you can begin cleaning your handgun. For more information about handgun cleaning, contact the professionals at Protect Institution and ask about their handgun basic training courses in the greater Cincinnati area. The experienced staff members at Protect Institution provide advanced firearm training to keep you safe while using a handgun. Call them today at (859) 466-7279 or visit their website for more details about firearms trading, handgun basic training courses, and more.